All transactions are safe and secure with a reliable history in online purchasing behind each of our associates. 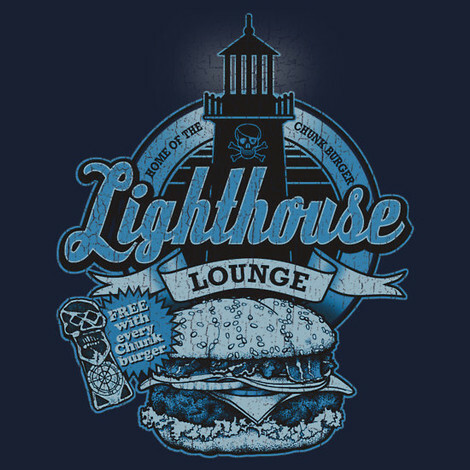 Buy the Lighthouse Lounge t-shirt to own Goonies clothing and merchandise. In the Goonies movie, Mikey Walsh (Sean Astin), Mouth (Corey Feldman), Data (Jonathan Ke Quan) and the rest of the gang explore the run down Lighthouse Lounge. They find adventure both inside the abandoned restaurant and beneath it. Stop by for their world famous Chunk Burger and lighthouse souvenir. You're going to need a good meal to give you energy to search for One Eyed Willie's treasure. Practice Mikey's speech that ends with the Goonies movie quote, "Down here it's our time!" In addition to the Lighthouse Lounge tee above, browse the Goonies Clothing Gallery for more apparel like men's and women's clothes, kids shirts or hoodies.